Last week, I bemoaned the near-total lack of capital funding for the MTA in the New York State budget, but one element of the budget that did include the bare minimum of a fiscal contribution to transit merits a closer look. The grant doesn’t help the MTA close its $15 billion funding gap, but it is earmarked for a specific project — and that is how these projects get built. Gov. Cuomo, you see, has guaranteed $250 million for Penn Station Access, the Metro-North project that will bring trains into Penn Station and four new stations to the Bronx. In a sense, it’s strange to see Cuomo pushing this project and funding for it now. Metro-North trains won’t operate into Penn Station until some Long Island Rail Road trains are arriving at Grand Central, and as we know, East Side Access isn’t schedule to wrap until 2020 at the earliest and perhaps later. It’s hardly a pressing priority. According to Cuomo’s budget release, the $250 million will cover a quarter of the project’s estimated $1 billion price tag, and New York expects the feds to pick up the remaining $750 million. Maybe Cuomo’s team feels this money won’t be available down the road; maybe the Governor just wants to cement the status of this plan or encourage the MTA start some work on the Bronx stations now even if the Penn Station Access piece won’t start until next decade. As we know, the plan includes stations along the New Haven Line at Co-op City, Morris Park, Parkchester, and Hunts Point and will involve some negotiation over the right-of-way with Amtrak south of New Rochelle. For its part, the MTA has called Penn Station Access “a lot of bang for not a lot of bucks.” But I’m still worried about the fare structure. The MTA has struggled to attract riders to its commuter rail stations within New York City because the fare structure is not aligned with the subway. The City Ticket provides some measure of relief on the weekends, but New Yorkers in solidly working class neighborhoods aren’t going to shell out $6 or $7 per ride. There is though an easy way to solve that problem, and for inspiration, the MTA could look to Paris. The City of Lights is attempting an experiment in pricing by instituting a flat monthly, universal fare for travel within a region that would encompass much of the MTA’s network were it grafted onto New York. At $76 a card, the price is nice too. Yonah Freemark at The Transport Politic penned a long post on this experiment, and he inexorably brings New York into the picture. “Imagine,” he writes, a single monthly fare card for all transit service” within the New York Metropolitan Area. Most importantly, the decision to spend hundreds of millions of euros on reduced fares could mean hundreds of millions of euros not being spent on better transit service every year—and some would argue that the best way to improve transportation is to expand service, not to lower fares…The cost tradeoff is certainly not one to scoff at. Last week, New York’s independent Citizens Budget Commission recommended capping the number of rides that can be taken with the (far more geographically constrained) unlimited fare card on New York City’s MTA Subway and bus system, in effect putting a limit on unlimited. Though the cap would affect relatively few people, it would be designed to raise revenues in a fiscally tight environment for an agency that is struggling with quickly growing ridership. On the other hand, were New York to change its fare policies to allow current monthly pass holders to ride the Long Island Rail Road and Metro-North Railroad to far-off destinations deep in Upstate New York, Connecticut, or Long Island—in other words, do what Paris is going to allow this fall—the MTA would be left with fewer revenues. But customers would benefit. They’d get faster service on commuter rail lines that many now avoid because of the higher price of travel (a trip from Jamaica in Queens to Penn Station in Manhattan, for example, costs $10 on the Long Island Rail Road for a 19-minute trip versus just $2.75 on the Subway for a 35-minute trip). People in neighborhoods currently only served by commuter rail, both in the city and in the suburbs, would suddenly have a reasonable-cost travel option equivalent to their peers with Subway access. People living in the city would suddenly have a much cheaper way to visit Long Island beaches on weekends, and people living on those beaches would suddenly have a much easier way of working downtown. These are not imaginary benefits. Moreover, the cost tradeoff is not so simple as a conflict between lower universal fares and better service. Rather, the funding used to pay for the universal fare comes from a revenue source that may not have been politically feasible to raise unless it addressed the issue of equalizing transport access among different areas of the city. In other words, the hundreds of millions of euros being spent on this change may have only generated political support for the improvement of the transit system in the context of standardizing fares. New York, of course, faces its own challenges as the money to subsidize fares would have to come from somewhere, and that somewhere — Albany — has been reluctant to touch any progressive ideas on transit funding or transit growth. Still, as the governor has clearly made Penn Station Access a priority, for the project to be a success, the governor and his appointees should consider the fare structure too. Even if New York isn’t prepared for a regional one-fare system, better aligning intra-NYC fares would be a step in the right direction. If anything, in Queens, it may be a way to spare the Queens Boulevard lines a capacity crunch, and in the Bronx, it could usher in a successful Penn Station Access project in eight or nine years. For reasons of politics, Penn Station Access — the plan to send Metro-North trains through four new stations in the Bronx and into Penn Station — has become Gov. Andrew Cuomo’s transit cause célèbre. The plan has support from Westchester and the Bronx, and Cuomo is angling to deliver something for the constituents of his most notable November challenger. Don’t get in his way. Ousted LIRR president Helena Williams’ criticism of a Gov. Andrew M. Cuomo-backed MTA plan to link Metro-North Railroad to Penn Station — potentially inconveniencing Nassau and Suffolk commuters — cemented her reputation as a fierce advocate for Long Island, but it also contributed to Williams losing her job, sources said. Williams, 58, whose seven-year stint as Long Island Rail Road president ended Friday, clashed with Metropolitan Transportation Authority chairman Thomas Prendergast over the Penn Station Access project, which would bring Metro-North into the LIRR’s West Side Manhattan terminal using existing Amtrak tracks around the same time the LIRR would connect to Grand Central Terminal as part of East Side Access, sources said. “I don’t think there’s any question that it helped her demise,” MTA board member Mitchell Pally said. The article explores this divide with some MTA Board members claiming Williams’ opposition was “parochial” and that it led to her ouster while others called her a fierce advocate for Long Island whose stance on Penn Station Access was not a “significant factor” on her departure. Read into that what you will. I believe that any opposition to Penn Station Access at this point is mostly parochial and has no place in New York City 2014. Solving regional mobility issues will require joint cooperation from both LIRR and Metro-North, and it may involve some sacrifices on each side. And to add to this, the LIRR’s East Side Access project is constructing an entirely new station at Grand Central deep below the existing one (like it or not, that’s what they’re going with). Therefore, bringing LIRR trains into Penn Station would result in no net loss of station tracks at Grand Central for Metro-North. Other than Madison Avenue Yard and the Lower Level Loop which was closed several years ago for ESA work, Metro-North has not been adversely affected by East Side Access. Over at Penn Station, there is no plan to construct a new 8-track terminal below the exiting one (well, at least for Metro-North trains). The plan to bring Metro-North trains into Penn Station would involve no addition of capacity into the current station. Since they have no intention of adding capacity at Penn Station to support Metro-North trains, those slots are going to have to come from someplace else. I don’t think Amtrak or NJTransit are going to volunteer some of their station slots for the sake of Metro-North commuters, so the last possible space to get slots is from the LIRR. And when East Side Access is completed, demand for the LIRR service to New York Penn will decrease slightly, and they will not need to run as many trains to Penn Station, so there will be some space opened up for Metro-North. But a massive unknown in this equation is just how much space the LIRR might free up in Penn Station. It’s food for thought as these projects come up for debate in the coming months. It certainly seems that Cuomo, not one to embrace transit, has started to put some political pressure on multiple fronts on the MTA. Between the TWU contract, the constant theft of supposedly dedicated funds and seemingly spurious statements from MTA officials about the agency’s financial situation, whether all of this politicking is for the good remains to be seen. The news that East Side Access is yet again over budget and off schedule isn’t just an embarrassment for a project that’s been plagued with troubles. It has a cascade effect too on the entire region. The longer we wait for East Side Access, the longer we have to wait for Penn Station Access, and the longer we wait for Penn Station Access, the less likely its current champion will be in office. Meanwhile, the MTA is trying to incorporate commuter rail into the city’s transit fabric, but can it do so without rationalizing the fare? In a sense, Penn Station Access is the dependent stepson of East Side Access. When ESA finally opens, a few trains will shift from the West Side to the East Side, and despite the selfish whining from Long Island politicians, the MTA will have space to send some Metro-North trains to the West Side. New Yorkers from both sides of New York City’s suburbs will be better distributed to the side of the city with their places of employ, and everyone wins. The planning for Penn Station Access can start now, and if the money is there, work can begin. 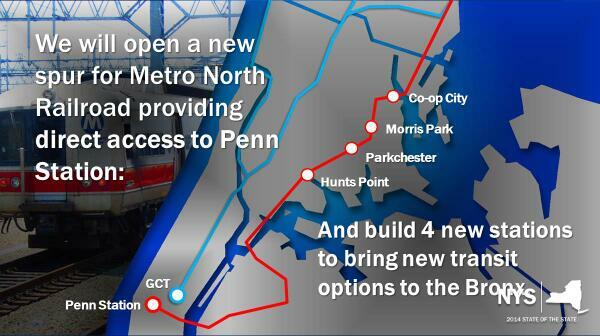 But until East Side Access opens, Metro-North riders hoping to get to Penn will have to wait. Furthermore, with Gov. Cuomo throwing his support behind the Penn Station plan, we may cast a wary eye at East Side Access delays. There’s a chance Cuomo could still be governor in 2020 when ESA opens, but he could move on to bigger and better things by then. If he’s not around, will Penn Station Access live to see the light of day (and the green of money)? It’s no sure thing, but the longer East Side Access takes, the more likely enthusiasm for Penn State Access will dim. Finally, there is a question of fares. The MTA clearly views Penn Station Access as a way to better serve areas in the Bronx that seem — and are — remote. As The Times details today, Co-Op City would stand to benefit tremendously from a Metro-North stop promising access to both Midtown and Greenwich, CT, in 30 minutes. But some residents are skeptical, and the culprit lies in the fares. A one-way, peak-hour, off-board Metro-North from Fordham is $8.25 per ride and the monthly for MNR service only is nearly twice as much as a 30-day MetroCard. The costs are out of proportionate to the benefits and do little to encourage ridership. There is, after all, a reason why as of the mid-2000s fewer than 1000 people per day used some of the Bronx’s Metro-North stations. So these are the challenges the MTA faces: Get East Side Access under control; continue the push for Penn Station Access; and figure out a way to better integrate intra-city travel into the Metro-North and LIRR fare structure. These aren’t insurmountable challenges, but the deck is ever so slightly more stacked against timely forward progress. So far, Gov. Andrew Cuomo — lover of muscle cars — has not been much of a transit booster. He’s allowed the MTA to do its own thing while maintaining a close relationship with the people he tasks with running the show, but while he’s been aggressive in sending out press releases touting big news, his three years in office have not involved any major transit pushes. This approach changed considerably with Cuomo’s State of the State speech on Wednesday afternoon. During his presentation of the laundry list of accomplishments and initiatives he hopes to launch as he ramps up his reelection effort this year, he spoke about a transit project familiar to Second Ave. Sagas readers. That idea — already in the planning stages — is Penn Station Access, a plan that would add four Metro-North stops to Bronx and bring trains into Penn Station. It’s not without its controversies, but it’s something that could be implemented relatively quickly if someone in Albany is willing to fight for funding. When Cuomo announced this news during his speech, I was a bit skeptical. Again, it seemed as though the Governor had simply decided to take something that had seen a scoping study issued in 2000 when Cuomo was with HUD and a project the MTA had already determined to see through and make it his. Curbed, in fact, called me out for that position, but as I’ve thought about it, we should embrace Cuomo’s acceptance of this plan. Even if he can convince the feds to fork over the dollars as part of general recovery and resilience efforts, he will have championed it through. The need for additional railroad network resiliency was made clear by Superstorm Sandy, when for the first time in their 100-year history, the Hudson River tunnels and two of the East River tunnels into Penn Station were flooded. These closures, along with those of subway and auto tunnels, cut Manhattan off from the region, impacting the regional and national economy. Without the Penn Access connection, Metro-North’s only Manhattan terminal, Grand Central Terminal, would effectively be cut off in the event of a Harlem River Lift Bridge failure, affecting more than 275,000 daily commuters. Using existing tracks, the project would establish new links for the New Haven Line that by-pass both the Mott Haven Junction and the Harlem River Lift Bridge. In the event of a disaster that disabled these points of access, commuters and others would still be able to use Metro-North to enter or leave Manhattan. In addition, the project provides Metro-North with access to a second Manhattan terminal in the event of an emergency affecting Grand Central or its tunnel and viaduct approaches. The Penn Station Access Project envisions the construction of four new stations in the Eastern Bronx and the purchase of new rail cars to support the new service. The project will for the first time connect these communities via commuter rail both to Manhattan’s West Side and to the I-95 corridor, providing historic benefits…These new stations are proposed for Co-op City, Morris Park, Parkchester and Hunts Point, which are not currently served by commuter rail. The benefits are obvious. The East Bronx will have 30-minute access to the West Side, and many Westchester and Connecticut travelers will have a one-seat ride to the area as well. If the MTA could figure out a way to rationalize the fare for intra-city travelers as well, so much the better. But the problems are numerous. First off, as we saw last spring, Long Island politicians can’t see through the benefits of Penn Station Access and have been threatening to oppose any plan that takes space away from LIRR slots at Penn. Never mind that many LIRR commuters will embrace East Side Access when it opens; never mind that Metro-North riders are New Yorkers who should have West Side access as well. Long Island politicians are not known for practicality, and they are going to dig in hard. Additionally, there is the matter of cost. While Cuomo didn’t discuss any figures, The Times quotes an “administration official” claiming that the project will cost in excess of $1 billion. Similarly, a 2008 state report estimated a $1.8 billion price tag for Penn Station Access. As Alon Levy skeptically tweeted, that’s what the cost for four new above-ground stations, some widening work done along a preexisting right of way, electrical work and rolling stock purchases would add up to be. There must be a way to build out Penn Station Access for cheaper. But that’s part of the process, and the process starts with someone in power taking ownership of the proposal. Right now, Penn Station Access is in Cuomo’s lap. We’ll get to see if he can turn this into his own transit project. We sure could use it. Despite the fact that Long Island has thrived due to transit, LI residents and politicians have long fought against any sort of transit upgrades for the area. Nassau County’s NICE has not been a success while NIMBYism has killed a much-needed third track for the LIRR’s Main Line. Now, with East Side Access inching forward an the MTA’s Penn Station Access plan for Metro-North coming into view, Long Islanders are throwing a selfish fit over transit improvements that will benefit the region. The latest salvo in the inexplicable war pitting Long Islanders against New Yorkers from points north of the city comes to us courtesy of Jack Martins, a State Senator from Nassau County. He’s not the first to object to Penn Station Access. In fact, we first heard word of Long Island insurgency in March when Charles Fuschillo raised some concerns. But Martins, in an Op-Ed he wrote for a local Hicksville newspaper, takes this opposition to an entirely new level. Lest these ideas feel lonely, they’re now trumpeting yet another that is so illogical that, if adopted, certainly belongs in their top goofs of all time: displacing LIRR trains at Penn Station for Metro-North trains. That would mean by 2016, four railroads – LIRR, NJ Transit, Amtrak and now Metro-North – would share the tracks and platforms with Metro-North adding an “estimated” ten trains per hour. I can just hear the collective sighs of those who regularly brave Penn as it is now and trust me, I sympathize with you. Why would the powers that be at the MTA want to make it worse? I see where this came from. Soon, the Long Island Railroad will have East Side Access into Grand Central station, so there should be room, right? Wrong. I’d love for someone involved – anyone really – to just try to remember why we’re spending billions of dollars to carve through millions of tons of bedrock under the East River. It was because Penn was overwhelmingly recognized as being much too crowded – and I might add – nobody could find any room on tracks leading into Grand Central for the LIRR. Are they now suggesting that taxpayers and commuters foot a bill that will eventually top out at $18 billion only to see the problem we attempted to alleviate made worse? It’s nonsense. The whole point of the East Side Access Project was to create a terminal under Grand Central Station that would increase ridership on the LIRR, accessing central Manhattan without affecting Penn. In fact, Metro North went undisturbed by the LIRR move to Grand Central because the LIRR was forced to create its own space, literally carving out a cavern for its own terminal. Where to even begin with Martins’ insanity? Perhaps the price tag would be a good start. East Side Access will clock far over budget and behind schedule, but Penn Station Access won’t cost an additional $9-$10 billion. It uses preexisting tracks and connections to deliver Metro-North trains to the West Side, a booming business center these trains currently do not access. These numbers are simply pulled out of thin air to further a poorly made point. Second, relying upon the mistaken belief that Penn Station Access would be ready by 2016 when it wouldn’t be considered until after East Side Access is ready, Martins claims that Penn Station Access would make matters at Penn Station worse. It won’t at all because when East Side Access is ready, a lot of the train traffic and passenger traffic into Penn Station will shift to Grand Central. Despite Martins’ protestations concerning more studies, the MTA and regional transit advocates have recognized the impact ESA will have on alleviating some train traffic into Penn and know that Metro-North can slot in without major issues. Politicians, on the other hand, cannot see the forest for the trees. Throughout the rest of the piece, Martins’ complaints about fare increases ring hollow, and his attempts to portray Long Islanders as victims of the MTA’s callousness seem petty at best and ignorant at worst. He’s distorting transit as a whole and making a mockery of a project that will vastly improve regional access to both sides of Manhattan. As long as we continue to elect these representatives, though, transit policy will remain forever locked in some soft of stasis chamber, not moving forward and nearly moving backward. Ultimately, Penn Station Access is not nonsense, and it is part of a regional economy and a regional transit network that should deposit riders on both sides of Manhattan. Provincialism from Long Island politicians is nonsense, and I fear these voices will only grow louder as the project nears reality. At some point in the future — hopefully soon — the MTA will again have a permanent chairman and CEO in charge of setting the direction for the agency’s future. The MetroCard replacement project can ramp back up, and, more importantly, such a person can begin to assemble the pieces for the MTA’s next five-year capital plan. In the meantime, we can glimpse the capital future from the bits and pieces that leak out to the public. Already, we know the MTA will be focusing at least in part on an aggressive effort to modernize its subway signals. We don’t know what will happen with future phases of the Second Ave. Subway, but it would be foolish to build just Phase 1 while allowing plans for the full line to be discarded. Meanwhile, though, Penn Station and Metro-North are clearly in the the MTA’s and politicians’ sight lines. When the East Side Access project wraps in 2018 or 2019 and the Long Island Rail Road deposits tens of thousands of riders into a deep cavern beneath Grand Central, Metro-North will have the ability to shift some rides to the West Side. We know that the MTA is moving forward with Penn Station Access studies, and now we learn that politicians are pushing the plan as well. Officials want Penn Station Access ready to go in 2019, and do that requires some aggressive planning and funding now. Their route set and destination in sight, Bronx and MTA officials are now pushing to secure funding and station space in order to send Metro-North trains rolling through the East Bronx by 2019. To enact the plan to build four new East Bronx stations where residents could catch Metro-North trains to Connecticut or to Manhattan’s West Side, up to $800 million and train slots in Penn Station are needed. For its part, the MTA, which operates Metro-North, has co-sponsored a soon-to-be-completed study to analyze whether Metro-North trains could fit in Penn Station and has been searching for possible funding sources, including Connecticut’s Transportation Department. Bronx elected officials, most notably Borough President Ruben Diaz Jr., have been lobbying state lawmakers to fund the project in the MTA’s next capital budget and demanding that Long Island state senators share Penn Station space currently used by the Long Island Rail Road. This project is a no-brainer in some ways. It requires no additional tunneling and opens up the West Side to transit riders from the Bronx and points north. On the other hand, the costs are tough to pin down at this early stage. Some initial estimates pegged the spend at around $400 million, but this recent report has the cost at twice that earlier figure. Costs will shift until — and probably after — a concrete plan is in place. Additionally, Long Island politicians are playing both tough to get and selfish. They claim that the LIRR will still need the slots in Penn Station after East Side Access opens and won’t share with other New Yorkers who may want to access the West Side from points north. On the surface, it’s a silly argument that likely isn’t supported by ridership, but it’s one that will play out over the next few years. Meanwhile, as DNA Info notes, for this West Side Access project to be included in the next five-year capital plan, the MTA will need to wrap up the environmental impact statement, identify operating partners and develop a space-sharing plan for Penn Station. These are obstacles but nothing that cannot be overcome. To improve mobility in the reason, Penn Station Access should see the light of day, and I’m sure we’ll be hearing more about it over the next few years.